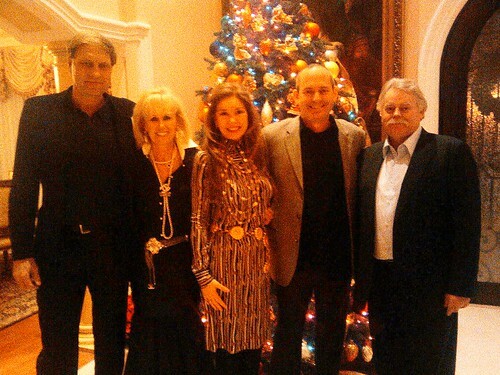 19 December, 2009, Beverly Hills, CA–/Newly appointed Las Vegas Honorary Consul of Poland John Petkus led a delegation of 5 to the Kröl mansion in Beverly hills, including Paulina Biggs Sparkuhl, Honorary Consul of Chile in Las Vegas and Dr. Aldo Aguirre, Honorary Vice Consul of Guatemala in Las Vegas. The Las vegas guests joined an intimate gathering, including the Consul of Polish Culture in Los Angeles, the Honorable Malcorzata Cup, and enjoyed the warm hospitality of the Kröl family during a presentation of the Museum of the History of Polish Jews. The Kröl family has lent its considerable support to the Museum, now under construction on the site of the original Warsaw Jewish Ghetto. The evening was a productive mix of philanthropy, business discussion and new introductions. Kröl Vodka CEO Philip Kröl and his wife Elaine were on hand in support of the family business expansions. With strong distribution and a devout following in the US, Kröl has its sights set on foreign markets. The Las Vegas contingent of Influential business diplomats, introduced by Honorary Consul of Poland John Petkus, may be a sign of things to come.